INTO SHORT-TERM FOSTER CARE TO UNDERGO REHABILITATION AFTER EMERGENCY CARE. At present we deal with 83% WILD birds & animals and 17% DOMESTIC birds & animals. Most of our WILD birds and animals are released back into the wild after emergency care and short rehabilitation. Our DOMESTIC bird and animal Short-Term Foster Carers & Re-Habbers ideally need also to be members of our Friends of Claws'n'Paws Hartlepool Community Group and need to undergo training and regular assessment if selected. We keep a waiting list of willing volunteers. Very occasionally we may need to find temporary short-term accomodation for birds and animals who have need immediate shelter in special circumstances. We normally refer all others leaving our emergency care to local and regional re-homing agencies and centres. Perhaps you could give a temporary short-term accomodation to a rescued small bird or animal..
You will need to be a member of our Friends of ClawsnPaws Hartlepool Group and need to complete and submit our on-line Volunteering form. See under 'Volunteering' on our Main Page. CARING FOR SMALL BIRDS & ANIMALS. Much of our work involves our Volunteer Carers, and Adoption Partners, caring for the small birds and animals we rescue through rehabilitation. (Rehabbers). For some this could mean long periods of time - weeks, months, and even years in many cases. With training YOU could become a Foster Carer or Sponsor friend to a small bird or animal whilst it is recovering and awaiting a new start in life? REGISTER with US and say you wish to be a Foster Carer. or state you'd like to sponsor a bird or animal in our longer term care by donating regularly or giving food or treats. We'll contact you and let you know how you can help. You can also help by donating food and other gift items at the Charity Collection Point Bin at Morrisons, Hartlepool or by visiting us at one of our Awareness or Exhibition Stand days. Thank You so much for Caring and Giving ! 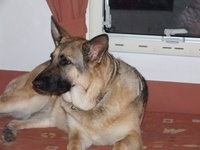 Baldrick had to be left in the UK when his owners emigrated & was one of our long term residents and was BLIND !! On a special diet, mainly IAMS Senior he was very old. At least 18 yrs but maybe as much as 21yrs. Many volunteers helped care for him. Sadly Baldrick died on 8th February 2012. Our longest rescued animal in foster care passed away. We sadly miss him, but we know that Claws'n'Paws gave him as best a full quality of life that we could, despite his disability. Baldrick remains in our hearts and minds as a symbol of what Claws'n'Paws is all about, hopefully for many years to come. One of Claws'n'Paws' very first successes, Grizzy was an under 1 year old with a much larger dog & 4 Children in a small house which meant she was overcrowded & was quite in-secure. When her owners handed her over for a better life in a good home she spent the first 6 months just getting over previous trauma and her totally timid, shy and frightened characteristics. But with lots of love and care, and despite the fact that she still ran away from 'big' men! she became a wonderful pet and lived permanently with Claws'n'Paws manager, Erika, serving as our ClawsnPaws Mascot. She was often with us at Fund Raising events too.She was a great vibrant pedigree Alsation & everyone commented on what a beautiful specimen she was. She was lot's of fun BUT still took a lot of looking after. She loved country walks & more open space & lots of nooks and crannies to explore. She was very good at keeping intruders away and guarding our exhibition stand donation and collection boxes!! Sadly, she died aged about 9 on 26th February 2014. She will be sadly missed by all who knew her and she now deserves eternal rest. Always loved and will never be forgotten. He had no name but kind people Michelle & Chloe in my neighbourhood temporarily took him in as he was homeless, living on the doorstep in the 'paper re-cycling bag' ! They got all his 'bits' done and just wanted a nice home for him to start a new life ? There might have been a bit of 'Persian' in his past.... WITHIN TWO DAYS of meeting them at Pets At Home, ClawsnPaws Hartlepool found him a new home courtesy of their members' rehoming system. Steve from Repose Reprographics managed to tell Julie (in Hartlepool) and she gave him a new home, a new name (Sydney) and one or two other cats to keep him company and to be friends with. Thank You for Caring for him Julie and giving him a great life. Sadly Sydney died after the best last 3 years of his life with Julie. We know he was a great cat and will be sadly missed. Our long time friend Badger the Rabbit who had been one of our education animals for 7 years died of natural causes in June 2017. We will sadly miss him and our Vice Chair, Paul Nugtent was his personal foster carer for some time. He was with him when he died and he passed very quickly. He had a good life here at ClawsnPaws Hartlepool. R.I.P. Badger. SEE OUR OTHER PAGES - from MENU at TOP of our MAIN PAGE - for how you can become an active member of our on-line our 'Friends of Claws'n'Paws' Hartlepool Group.